Girl Tech teaches middle schoolers about technology! WHAT: Join the University of Illinois Springfield’s Computer Science Department for two days of fun exploring technology during Girl Tech 2013. Hands-on activities include geo-caching with iPad, Scratch programming, molecular gastronomy and much more. WHEN: Thursday, June 13 and Friday, June 14, 2013 from 8:30 a.m. to 5 p.m.
Highlighting the sessions this year is “Geo-caching with iPad”, which will use software and maps for creating a treasure hunt around campus. “Fabulous Fab Lab” will use some new high-tech toys: a 3-D scanner, a laser cutter and a 3-D printer. “Green Screen and Limelight”, will allow girls to record short videos and insert themselves into a background anywhere on earth. Using the MIT-designed language “Scratch”, the girls will create and program their own computer games. Other sessions this summer will include: “Hi-Tech Design using Gimp”, which will allow girls to design a t-shirt for their team. “I see SUN spots!” will use telescopes equipped with solar filters to view current sunspot activity. “What’s to Eat?” will look at technology in the kitchen by making snacks with molecular gastronomy. The registration fee is $30 per girl, which covers lunch both days, snacks and a participation t-shirt. To be eligible to participate, the girl must be entering 7th, 8th or 9th grade in the fall of 2013. For more information about the camp and to register visit http://csc.uis.edu/girltech/. The registration deadline is Thursday, June 6. Former Governor Jim Edgar part of panel discussion on "The Two States of Illinois"
WHAT: Former Illinois Governor Jim Edgar will join a panel of distinguished guests to discuss how the economic, social & political differences between Chicago and the rest of the state present challenges for the governance of Illinois. WHEN: Thursday, June 6, 2013 at 7 p.m. DETAILS: This panel discussion will explore how the perceived division between Chicago and the rest of Illinois is affecting state leadership and decision making, public perceptions of governmental effectiveness, and political and social operations. Edgar will be joined by Chicago Sun-Times columnist and Capitol Fax newsletter publisher Rich Miller, UIS Political Science Professor Christopher Mooney, and Chicago Metropolitan Agency for Planning Executive Director Randy Blankenhorn. 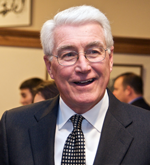 Edgar, a distinguished fellow with the University of Illinois Institute for Government and Public Affairs (IGPA), was the 38th governor of Illinois. As governor, he made fiscal discipline and children the cornerstones of his two terms. First elected in 1990, Governor Edgar won re-election in 1994 by the largest margin ever for a governor. Four years later Governor Edgar left office with the highest approval rating in state history. “The Two States of Illinois” presentation is sponsored by the University of Illinois Springfield Engaged Citizenship Common Experience (ECCE) Speakers Series and the Central Illinois Chapter of the American Society of Public Administration (ASPA). The event is free and open to the public. For more information, contact Kimberly Craig at 217/206-6245 or kcrai01s@uis.edu.